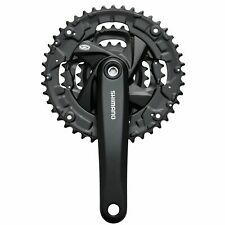 Shiamno FC M131 Crankset Square 42/34/24T 170mm MTB 6/7/8 Speed. Crank Arm Length: 170mm. Construction: Square. Compatible Chain: HG/UG 6/7/8-speed. Gear: 3 x 6/7/8-speed. Not including bolts. 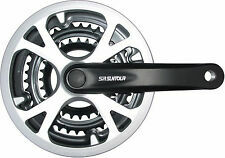 Shimano FC-TY701 Tourney chainset 7 / 8-speed, 42 / 34 / 24, silver with chainguFeatures Entry level 6 / 7 / 8-speed chainset compatible with Hyperglide chains. Call in for a look and enjoy a brew whilst you look around. Pro wheel 28/38/48 x 170MM C/Set all black. Quality Mountain Bicycle bike Chainset 22/32/42 Black 150mm Cranks chain set. Chainset Black. Size 22/32/42 Chainrings x 150mm Crank Arms. Can't find what your looking for?. Got everything you need?.